Resolution I/4 of the ICCM invited Governments in a position to do so, regional economic integration organizations, intergovernmental organizations, the private sector, including industry, foundations, non-governmental organizations and other stakeholders, to contribute to the QSP. As provided for in resolution I/4, bilateral and multilateral donors and other entities can make financial or in-kind contributions to the QSP outside of the trust fund. Non-trust fund contributors to the QSP are encouraged to declare their contributions using the official reporting form. 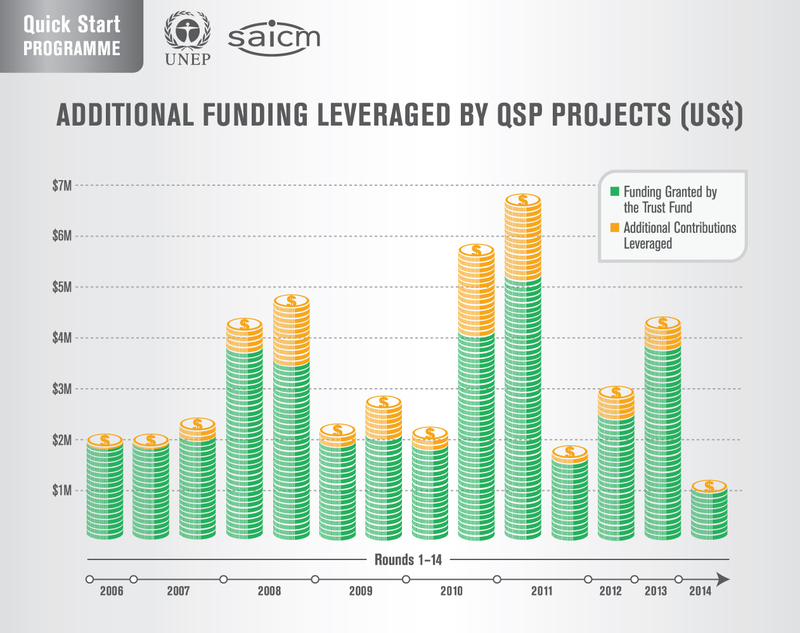 Since its establishment in 2006 through until 2015, the QSP has mobilized approximately US$49 million. This amount includes approximately US$39.4 million in cash contributions to the Trust Fund and US$9.7 million in cash and/or in-kind contributions from project implementers and executing agencies. 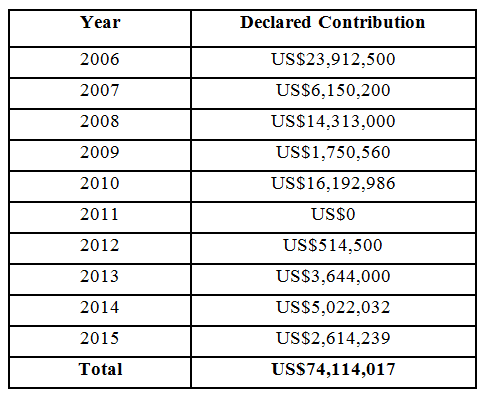 In addition, US$74.1 million in non-Trust Fund contributions were reported over the period 2006 to 2015. 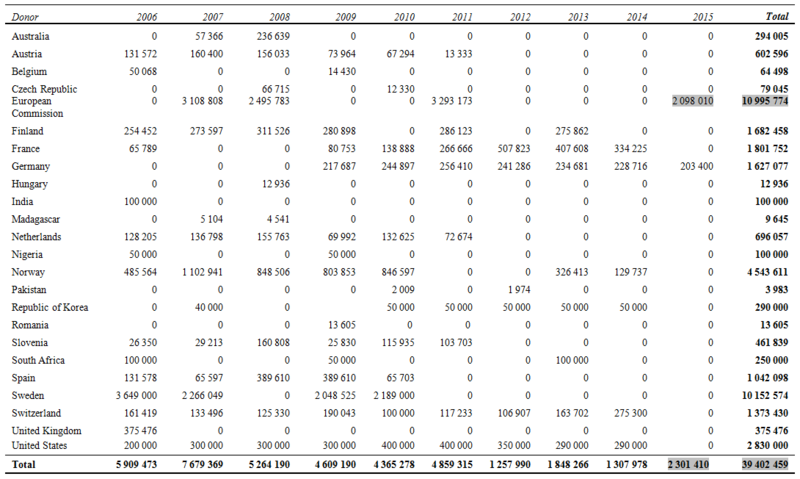 From 2006 to 2015, the declared non-Trust Fund contributions reached a combined total of approximately US$74.1 million. The contributors for 2006–2015 have been the Governments of: Canada, Japan, Switzerland, Sweden, the United Kingdom and the United States of America. Intergovernmental organizations: the Food and Agriculture Organization of the United Nations (FAO), the United Nations Development Programme (UNDP), the United Nations Environment Programme (UNEP), the United Nations Industrial Development Organization (UNIDO), the United Nations Institute for Training and Research (UNITAR), the World Health Organization (WHO), and the Organisation for Economic Cooperation and Development (OECD). Additional non-governmental donors have been: Argentine Society of Doctors for the Environment (AAMMA), the BASF, the Dow Chemical Company (DOW), International Council of Chemical Associations (ICCA), the International POPs Elimination Network (IPEN), and the International Society of Doctors for the Environment (ISDE).